As we transition into the Jewish New Year of 5778, it is our wish to thank you for your support and commitment to the vision of CJCUC. The work of the Kingdom of G-d can only be accomplished by working with others and acknowledging those who have paved the way before us. In a few months, CJCUC will be celebrating its 10 – year anniversary. What began as an Orthodox Jewish institutional response to Christian support of Israel has turned into a phenomenal sacred journey in building community between Jews and Christians. Below, please find some of the highlights of the last 22 months. Spearheading the first Orthodox Rabbinical Statement on Christianity in December 2015 entitled: To Do the Will of Our Father in Heaven: Toward a Partnership between Jews and Christians, the Statement has now been signed by over 80 Orthodox rabbis from around the world. The Statement has been studied in academic institutions, translated into many languages and has inspired other Orthodox entities to publish their own positive statements on Christianity such as Between Jerusalem & Rome. Also, the first academic publication on the Statement was published in German entitled: Toward a Partnership between Jews and Christians. It was a partnership project between the Jewish University Heidelberg and The Stuttgart Lehrhaus – Foundation for Inter-religious Dialogue. 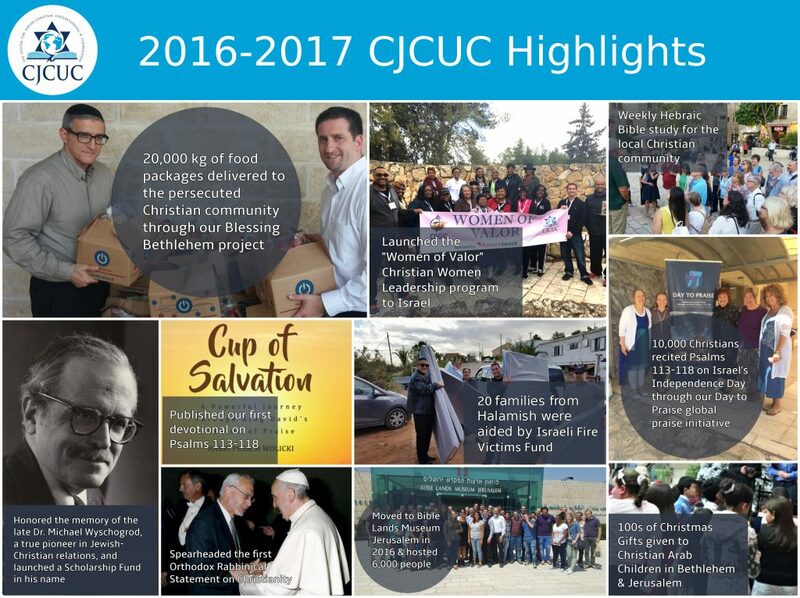 Responding to the economic plight of the Christian Arab community living in the birthplace of Christianity, CJCUC launched Blessing Bethlehem in September of 2016 to provide humanitarian aid to the Christians living in Bethlehem and the surrounding areas. Each week, nearly 200 families receive food packages, totaling 20 tons of food delivered to the Christian Arab community through this program. In addition, during Christmas of 2016, CJCUC arranged for Christmas gifts to Christian Arab children living in Bethlehem and Jerusalem. When ISIS attacked 3 separate Coptic churches in Egypt during Palm Sunday, CJCUC partnered with Pastor Steven Khoury to establish a Fund for the Persecuted Christian community. We raised enough monies to send a delegation to the area to provide food packages to the victims of terror and purchased metal detectors for the churches. In addition, CJCUC published an article about the Persecution of Christians in Middle East and was a participant at Tel Aviv University’s conference on the issue. In order to accommodate an increase in Christian groups interfacing with CJCUC’s Hebraic Bible studies, we moved our headquarters from Efrat to the Bible Lands Museum Jerusalem in July of 2016. The authentic collection of ancient art and archaeological artifacts of BLMJ provides visitors with a visual panoramic view of life between the lines of the Bible as well as offering a transformational journey into the world of Scripture. In addition, we also launched a weekly Bible study for the local Christian community. Since our move to BLMJ last year, we have hosted over 6,000 people at the museum. When the raging fire crisis hit Israel in December of 2016, evacuating over 70,000 people from their homes, CJCUC worked with both Jewish and Christian organizations to bring relief to those who lost their homes. 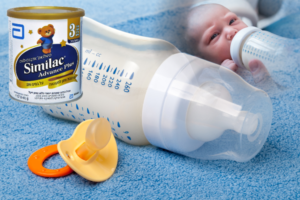 Our relief efforts focused on two communities, Halamish and Neve Tzuf, helping 20 families to rebuild their lives again. Over 10,000 Christians committed to reciting Psalms 113-118 (Hallel) on Israel’s Independence Day – May 2, 2016 – as part of the Day to Praise initiative. 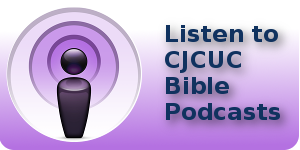 CJCUC published its first devotional to these psalms entitled: Cup of Salvation: A Powerful Journey through King David’s Psalms of Praise as well as produced the Cup of Salvation podcast in partnership with JewishCoffeeHouse.com. Honoring one of the great Orthodox Jewish theologians who recently passed away, CJCUC established The Michael Wyschogrod Scholarship Fund commemorating the life of Dr. Michael Wyschogrod by financially aiding undergraduate (juniors or seniors) and graduate students wishing to enter into the field of Jewish-Christian relations. In addition, CJCUC partnered with The Wasserman Jewish Studies Center & The Baruch College Department of Philosophy to celebrate the Jewish-Christian Relational legacy of the late Dr. Michael Wyschogrod on October 31, 2016 in New York City. We are grateful to the generosity of the following organizational entities, ministries, and foundations: John Hagee Ministries, Israel’s Department of Justice Estates Committee – Administrator General, Zion’s Gate International, The Stuttgart Lehrhaus – Foundation for Inter-religious Dialogue, Neil & Marie Genshaft and Family, Dr. Rich Sidlow, Howard Katz, Bridges for Peace, Christian Friends of Israel, The Museum of the Bible, El Shaddai Ministries, Morning Star Fellowship, Faith Family Church, , Light International, New Life Christian Center, Keshet Educational Journeys, Kenes Tours, Israel365.com, Crosspointe Christian Centre, Faith Family Church, Glory to Him, Hearts on Fire Ministries, Lake View Assembly of God, New Life Assembly of God, New Life Church, Passages, Real Life Assembly of God, Sioux Falls Faith Temple, Sioux Falls First Assembly, Victory Christian Center, Eagles Wings, David & Marsha Conrad, John & Lisa Crowe, Hunter Family, June Winegardner White and Denise Garlick. A special thank you to Roger and Susan Hertog & Family for their belief in CJCUC’s vision and major contribution to establish the Center in 2008 as well as their continued funding several years afterwards. Also, we extend our gratitude to the Paul E. Singer Foundation’s past donation in helping the Center to bring Christian leadership to Israel.